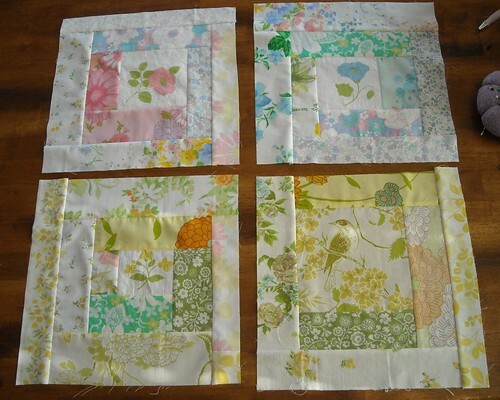 I made these blocks from my vintage sheet fat quarters this afternoon. I didn't even know I had that bird fabric... there were only 2 good repeats of it on the piece I had so I had to make a bird block. The next batch will start with my "darker" fabrics in the center and outside. They are going to end up at 12.5" square, I haven't trimmed them yet though. My deep thoughts about log cabin blocks--every time I make them, especially improvised ones, I think the inner fabric choices are so important and then it turns out that the outer strips really make up so much more of the block than the inner parts. Maybe I need to plan from the outside in one of these times. Very nice log cabin blocks Vicki, I am working on my first one today. Love these - so homey and vintagey, I'll bet they're so soft! And love your new header! The finished quilt will be so pretty! I love the quilt I made for my daughter out of vintage sheets. 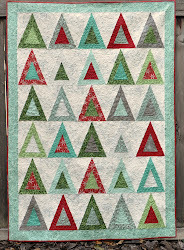 Hey, I found your blog because I googled how to piece quilt batting. It directed me to your post from 2 years ago. Just wanted to say thanks! What a great use of vintage sheets...a nice change to the normal block patterns that you normally see being used for vintage sheets. Those are really beautiful! I love the 'vintage' look the fabric (sheets) give it! Nice job. oh my, i love that! i have the sheets from the top right block. the center. the blue flower. my grandmother gave me those. it looks wonderful!